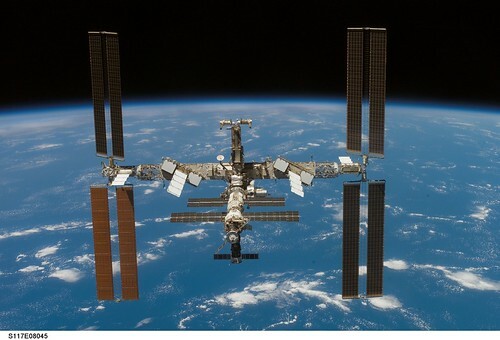 The Space Shuttle Atlantis will be coming home this week. Todays landing was cancelled due to the low pressure system spinning off our coast. They will have another chance tomorrow and Saturday to land at the Cape. 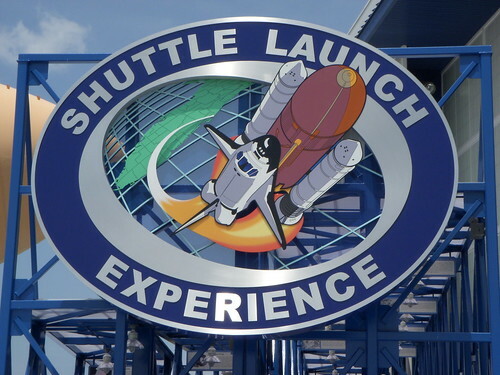 Yesterday I spent the day down at Kennedy Space Center Vistor Complex for a Florida Attractions Association board meeting. After the meeting Steve Geis, Operations Director for the complex, took us over to the Shuttle Launch Experience and I got to experience a shuttle liftoff for the second time (see my previous blog). 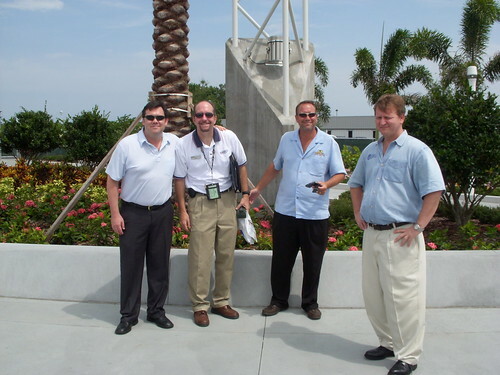 From left to right: Mike Donaldson, Florida Attractions Assoc. Staff; Steve Geis, Kennedy Space Center Operations Director; Keith Charlton, Pirates Dinner Adventure in Orlando; Drake Decker, Florida Suncoast Tourism Promotions. This is the sign outside of the simulator. This is a shot of the preshow. If you want to see more, you need to go ride it! It is outstanding! 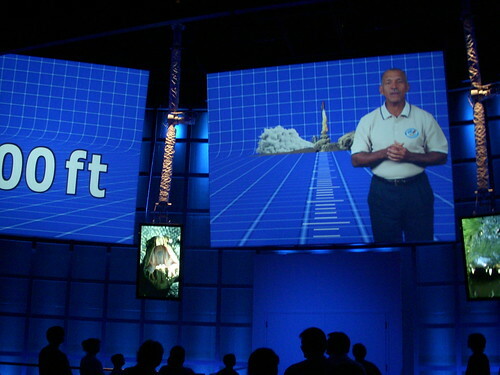 On the way in you hear astronauts talking about their own experiences aboard the shuttle. What really struck me was when a couple of them commented about how their teams were made up of folks from many different countries and backgrounds. They all have to work together and work to get along inside that spacecraft, and in the International Space Station, to insure not only their success, but their very survival. Things have not changed much. It was vital that people traveling on the sea to the new world get along as well. Discipline aboard a sailing vessel was strict but served a necessary purpose. The lines, sails, and helm had to be handled correctly for the vessel to reach its goal. Markers and navigation lights along the coast insured that the travelers arrived at their destination safely. Everyone worked together, or everyone could be lost. Like the explorers and settlers who sailed to St. Augustine beginning in 1565, we are now striking out in ships to explore the vastness of space. But as the astronauts have said from their vantage point looking down on us, our own planet is a spaceship. We must all work together to keep our vessel seaworthy and on course, or we could all be lost. An excellent point considering everything that is going on in the world these days. Perhaps we could all gain from their lofty perspective. 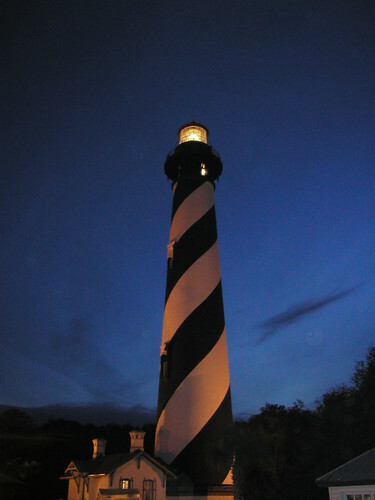 As for the crew of Atlantis... from the old world to the new...we are keeping the light on for you here at the St. Augustine Lighthouse. Have a safe journey home. Hey there! It's Courtney Elizabeth, I can't sleep and Mom told me about your Blog, so I thought I would pay you a visit! What a fun time it looks like you get to have! I read some of the history about it, and it all is very interesting. I am proud to say my Uncle is the LIGHTHOUSE KEEPER, hope all is well Love you guys!